A few days back Intel confirmed that they will not be using Extreme Ultra Violet Scanners to produce 10nm dies, something that though expected, still managed to raise a few eyebrows. Most of Silicon Valley agreed that Intel does not need EUV to pass 10nm, but it had also agreed that Intel would have absolutely no trouble with 14nm and that doesn’t appear to be the case. Intel has been acting very weird as of late, it has delayed its road map of 14nm processors and has been following Moore’s Law on a sheer technicality. Intel is now stating that the 10nm Processors that are queued for 2016 will not require EUV Scanners. “We know we can get through 10nm without EUV,” said Brian Krzanich, CEO of Intel at the Citi Global Technology Conference. Once again, the statement is not really surprising, its only when you put it in context with the Broadwell delay that eyebrow raise I mentioned earlier happens. See, Intel really should not have had problems with 14nm, there just isn’t any conceivable reason for it. The delay could have been artificial in nature but we wont recognize that facet in this post because that isn’t an official stance. 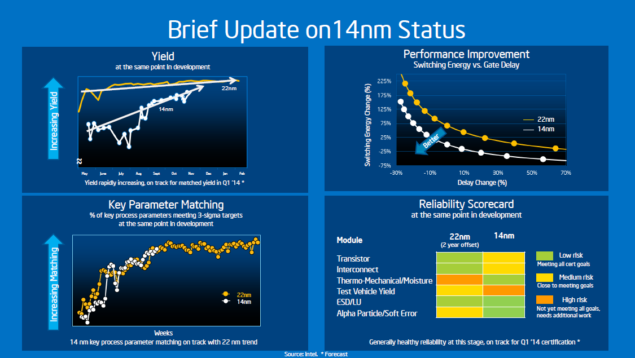 So the question is, how can Intel confidently predict 10nm in 2016 without EUV after the unforeseen hurdles they faced with Process 1272 (broadwell)? P1272 is arriving in 2015 by the skin of its teeth so how can P1274 a die shrink, arrive in 2016? With EUV it would have been child’s play to push 10nm out the door after the initial prototyping. Ofcourse, adapting EUV is no easy task and by Intel’s comments we will not be seeing it for 2 – 3 years at least, so theres that. I would be very interested to see whether Intel can truly deliver on its claims of bringing 10nm without EUV in 2016, though to be honest, it would probably raise more questions instead of answering any if they managed to do it. A very interesting combination would be EUV and 450mm wafers introduced at the same time, though to be honest, that is too far fetched and will probably never happen.